The mission of SnacShack Catering Services is to help organize a stress free event for our clients in providing flawless and prompt service with the finest ingredients and freshest foods available. We will do this always with integrity and an attention to detail that exceeds our customers' expectations. We strive to offer fair pricing and promote the "best value" for the products and portions we provide. An impeccable collection of the perfect classic sandwiches that will surely please everyone. Choice of chicken salad, smoked ham, oven roasted turkey, and roast beef layered with provolone, American, and Swiss cheeses. All half-sandwiches served with fresh romaine lettuce and sliced tomatoes on a variety of honey wheat and French white breads. A wonderful presentation with a lighter taste, choose our delicious sandwich wrap platter. Available in chicken or tuna salad plus a variety of sliced meats including roast beef, turkey, and ham with cheeses. diced cucumbers and tomatoes plus mixed lettuce leaf. Wrap flavors include but not limited to garlic herb, multi-grain, and spinach. Enjoy an assortment of our finest sandwiches on fresh baked mini rolls. A perfect appetizer size, choose from: chicken salad, tuna salad, pimento cheese, or turkey & cheese. All sandwiches are served on an assortment of wheat, onion, and sourdough rolls. Slow oven-baked seasoned chips hand cut daily from our fresh bagel varieties. Choices of spice flavors include: original Italian, pumpernickel cheddar, 3-pepper spice, sweet cinnamon, and sea salt. Arcadian mixed greens, sweet grape tomatoes, cucumbers, shredded carrots, aged cheddar cheese, with croutons and your choice of dressing. One of our most popular Special Desserts, the seven-layer red velvet bar is our elite choice in a class of its own. Baked atop a red velvet base, layers of shredded coconut, Hershey’s white and chocolate chips, chopped pecans, and a milk chocolate and vanilla cream drizzle. A smorgasbord of heavenly flavors. Our double chocolate brownies have an incredible sweet richness enhanced by baked-in chocolate chips. A perfectly caked outside combined with a delightful gooey inside. You’ll love the quality taste of this indulgent dark chocolate square of sweetness. Regular Size Tray – 48 cut pieces. Our homemade cookies are made with the purest natural ingredients. Enjoy just the right amount of chewy crispness in our chocolate, double chocolate, peanut butter and oatmeal raisin varieties. This perfectly sized treat is sure to satisfy that mouthwatering cookie craving. Little lemony pleasures sprinkled with powdered sugar. That undeniable sweet and tart goodness. If you like pecan pie, you’ll love this honey pecan crunchy treat with a sugar butter crust. Bagel varieties include: asiago, blueberry, cinnamon raisin, everything, garlic, herb parmesan, jalapeno cheddar, onion, plain, poppy seed, salt, pumpernickel, sesame, spinach 3-cheese, and veggie. Minimum quantities may apply to some varieties. Spread flavors include: Sweet Honey Butter * Classic Hummus Sundried Tomato Basil * Green Onion Bacon * Ginger Pecan Butter Lemon Garlic * Maple Bacon * Port Wine Cheddar * Nutty Cheddar Raspberry Lime Chipotle * Cranberry Walnut * Garlic Parmesan Veggie Spread * Feta Dill Garlic * Bacon Cheddar Spread * Olive Garlic Spread. Our delicious muffins are always fresh and fluffy. Great for any group breakfast or brunch event. Available in a variety of flavors: blueberry lemon, banana walnut, pistachio, chocolate chip, orange cranberry, apple crumb, brown sugar pecan, savory ham and cheddar, savory bacon and cheese, lemon poppy seed. Minimum quantities may apply to some varieties. A made-from-scratch baked (not deep fried) potato hash brown casserole with sausage crumbles, melted cheddar cheese, and scallion onions. SnacShack Business Lunches are served with your combination choice of sandwich breads or bagels, soup and salad, with bagel chips and a special dessert or fruit bowl. Choose any combo: 1) Full Sandwich2) Half Sandwich + Soup 3) Half Sandwich + Side Salad4) Soup + Side Salad; Call for selection of soup and deli choices. Six meal minimum order from…$7.95 ea. A bakery-fresh full size sandwich with homemade chicken salad, tuna salad, or ham salad spread on one of our soft mini-loaf breads. Garnished with crisp lettuce shreds and sliced tomatoes plus a side of our baked bagel chips. Choose from sesame, white, or honey wheat breads and your preference of a homemade chocolate chip or peanut butter cookie. Free delivery available for six or more lunches. SAMY Lunch Box…. $8.25 ea. Enjoy a bagel sandwich luncheon that feeds 25 or more guests for any occasion or get-together. Sandwich variety includes turkey & American cheese, ham & Swiss cheese, and double bacon BLT’s served on an assortment of onion, plain, and asiago bagel breads with lettuce and tomatoes. Each bagel sandwich is individually wrapped. 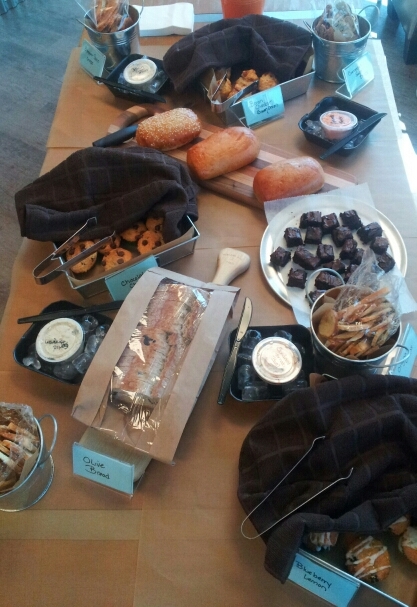 Luncheon includes baked bagel chips and brownies. SnacShack is proud to offer and serve Clay County and surrounding areas our boxed lunch menu for students. 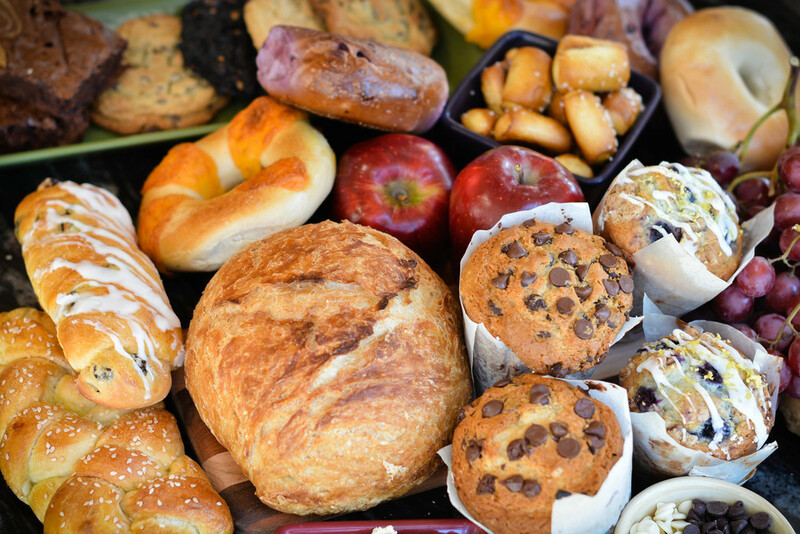 We customize an offering specifically for your school with choices of sandwiches, pretzel bites, vegetable snacks, cookies, and beverages. Prices vary according to content and quantities. Please contact our catering office for details.